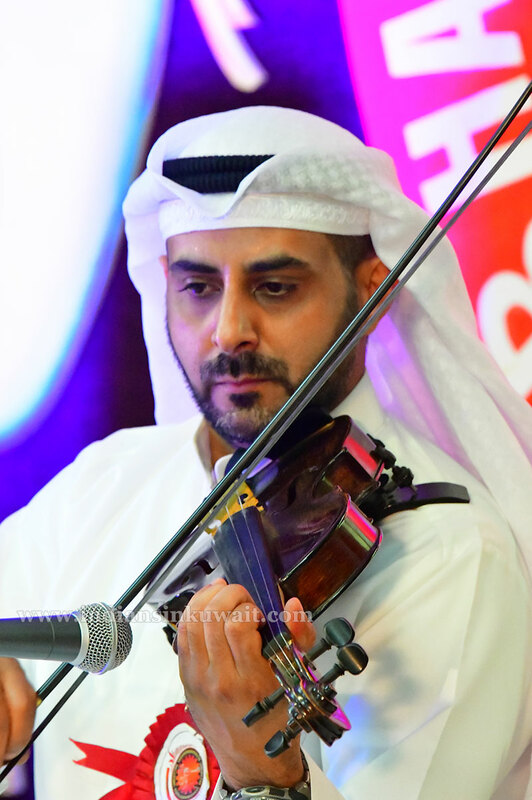 Kuwaiti Violinist, Abdul Aziz made waves among Indians by playing “Harivarasanam”, the lullaby to Lord Ayyappa while the issues related to allowing of women pilgrims at Sabarimala, Kerala was at its peak. Audience of Navrathri Music Festival – 2018 organized by Bharatheeya Sangeetha Sabha (BASS) rejoiced and clapped as Abdul Aziz played Harivarasanam along with his Guru Balamurali Karunagappali. Abdul Aziz also played few other beautiful pieces of Carnatic music. We, the IIK team, were astonished when we received a warm welcome at his practice session with a Vande matharam followed by Raghupathi Raghava along with Balamurali Karunagappalli (Violinist) and Arun Nair (Mridangam Artist). Abdul Aziz hails from a musical family where his father is a Professor of Music College and mother is a Doctor who plays the flute. His brother plays flute and Indian Tabla. All four of his children are into music while his wife is a good listener and supports the musical interests of her husband and children. Abdul Aziz started learning music at the age of 5. Though he started with Arabic Music, he was very keen to learn Carnatic from a very young age. He wanted to go to India to learn Carnatic Music as YouTube and online courses were not common during those days. However, he couldn’t make it due to time and other constraints. Later on, in Kuwait he became the disciple of Kannamangalam Satheesh Kumar, a famous violinist from Kerala and fulfilled his dream by learning Carnatic music. Unfortunately, Satheesh went back to India and Abdul Aziz had a break in his Carnatic training. Then he was introduced to Balamurali Karunagappali who was Satheesh’s disciple and a very well-known violinist and teacher since past 35 years in India as well as in Kuwait. Thus, Abdul Aziz’s Carnatic musical journey restarted and now he is well versed in Carnatic music. He has a profuse knowledge about 72 ragas of Carnatic and spoke to us in detail about the differences between Arabic and Carnatic music. It was always a heartfelt dream for Abdul Aziz to perform in a concert for an Indian show. He attends most of the Indian shows happening in Kuwait and had performed one or two simple songs during Indian programs. The BASS Navarathri show was the first time that he performed a full-fledged concert in Carnatic for an Indian show. While thanking BASS-Kuwait, Abdul Aziz opined that India is rich with cultural history and Indian music is full of techniques which makes it powerful in communicating empathy. In his opinion there is no language for music, it is full of emotions and we can feel the language of music just by listening to it. He believes Indian music is full of depth and can make people cry just by watching Indian cinemas. Music does not need understanding the language but by the tune of music is sufficient as Carnatic music is powerful enough to go directly from your ears to heart. While speaking about the influence of Carnatic music among Kuwaitis he reminisced about the trading relationship which Kuwait had with India and the days when Indian Rupee was the official currency of Kuwait. 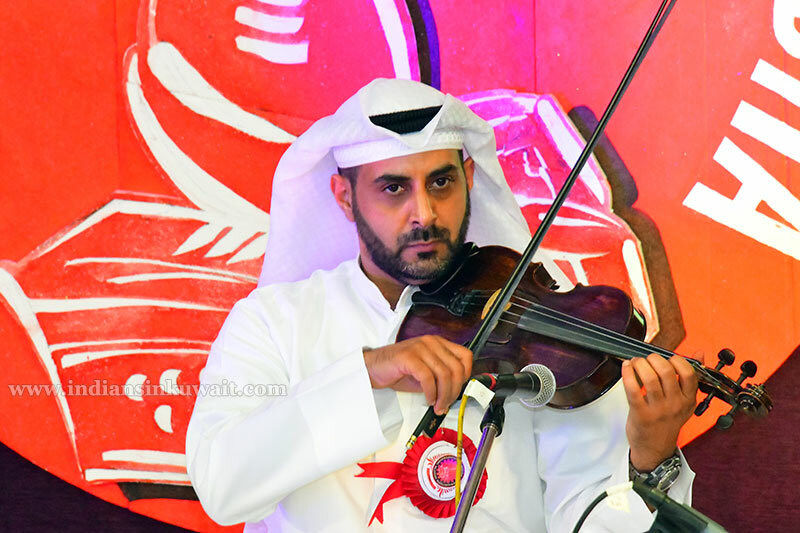 He has played Carnatic music in many Kuwaiti shows and was well appreciated by the Kuwaiti music lovers. He has also tried fusion by mixing Carnatic and Arabic music. Over and above Abdul Aziz has also taught some of his friends the techniques he learnt in Carnatic. Balamurali had great opinion about his Kuwaiti disciple. The most important quality which he found in Abdul Aziz is that he goes in details and practice well until he gets the essence of the music completely. Abdul Aziz mentioned that his Guru gave him 3 classes for Harivarasanam but he practiced over 30 times from home to get the exact notes of it and he will practice music until his last breath. Balamurali never thought that this tune would become such a super hit while teaching, but it really made waves and the videos became viral in social media. Scintillating performance of Abdul Aziz simply says that language or geographical boundary is never a barrier in learning any art form. Sky is the limit if you have the will to learn and mind to practice. We eagerly await more magic from the instruments of this talented musician, who is so keen to absorb the culture and heritage that ancient Indian Carnatic music has to offer. Well done. Congrats Mr. Abdul Aziz. I really appreciate your interest in Indian carnatic music. You are a great violinist. Keep it up. Hearty Congratulations to Mr. Abdul Aziz . Very good article by Mrs: Jisha Jagdish about the talents of Kuwaiti Violinist among Indians. Appreciate your efforts to write about Indian Music. Wishing you a Blessed musical Journey!!!! Proud to be his Violin Student. Great! Congrats Mr Abdul Aziz for your interest in Indian Classical music! The Vande Matharam is excellent..
Nice Article Mrs. Jisha, Congratulations, keep writing.